Career/education, family, friends and leisure are typically the four important spaces in a young person’s life. Pravah, with support from ComMutiny – The Youth Collective and Oxfam-India, has developed the concept of ‘the 5th space’, which enriches relationships in the other four spaces by nourishing the capacities of young people to understand and define their connection to the world and to take effective and responsible action. The 5th space believes that self transformation is the first step towards creating change in our relationships and in society. Over the next few issues of Teacher Plus, we will feature stories of people and organizations making a difference in education by engaging with processes at the heart of the 5th Space formulation. This month‘s article brings you the story of Anurupa Roy. “When I see a bunch of young people, I see huge potential. It is the youth that will save our country. They have got immense energy. We need to trust their capabilities. Instead of doing that, we mollycoddle them thinking they are too fragile and need to be sheltered. I hear adults tell young people, ‘You know nothing about this. Don’t try your hand at it.’ Now isn’t that ridiculous? How will young people grow to take ownership if you don’t let them try out something on their own?” says Anurupa Roy, Founder and Managing Trustee of Kat Katha Puppet Arts Trust in Delhi. Her way of thinking is perfectly aligned with the 5th Space idea of young people being entrusted with leadership roles to help them realize their potential. This 36 year old was barely 21 when she started Kat Katha. Though it has been a decade and a half, she is all too familiar with the dilemmas and struggles that young people making career decisions have to go through. Though she pursued puppetry as a hobby class at Sardar Patel Vidyalaya and spent a lot of time doing theatre and puppetry at Lady Shriram College, she found it difficult to acknowledge to herself that this is what she wanted to do all her life. She toyed with the idea of studying social anthropology or training to be a filmmaker. She even entertained the thought that if she could not be a performer, she would take up a profession that would allow her to be around performers. Anurupa’s mind was occupied with ideas about what young people generally do at her age, what her peers were doing with their lives, what it would mean to steer away from the norm. She was strongly considering joining Jamia Millia Islamia University in Delhi or the School for Oriental and African Studies in London. However, she was able to muster the courage to pursue her love of puppetry, and this was partially due to the faith placed in her by Dr. Meenakshi Gopinath, her college principal. 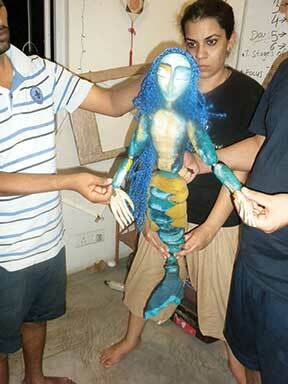 Anurupa chose puppetry knowing that there was no professional training available for the same in India. She went abroad to study at Dramatiska Institutet for Film, TV, Drama and Radio at the University of Stockholm in Sweden, and at Scoula De La Guaratelle (School of Traditional Glove Puppetry) at Naples, Italy. She has since created a substantial body of work in puppet theatre offering perspectives on reproductive health, livelihood building for tsunami survivors, women’s experiences in conflict zones, and other social issues. 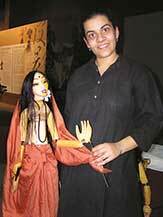 Her belief in puppet theatre being a non-structured, flexible space for creative self-expression has found validation in the form of invitations to numerous international puppetry festivals and conferences, as well as the Junior Fellowship of Arts for Puppet Theatre for 2003-05 awarded by the Department of Culture, Government of India. Apart from this, she conducts workshops with students from schools, colleges, universities, and also youth groups that have come together around common interests in film, theatre, education, conflict resolution, and peace building. Her workshop processes involve a lot of self-work. Her objective here is to enable the young participants to explore their own thoughts and express themselves. If the group has formed around a particular thematic interest or issue, she works with them to create new performances that address their issues and express them in a way that feels organic and authentic to them and is also effective in communicating to an audience. “Art forms are containers. They are not just ways of expressing but also ways of looking at the world, ways of living your life. As an artist, you have to constantly reflect on the world and saying something – whether it is a performance or a workshop. When I am doing a workshop, I ask myself ‘Can I catalyze something for these people so that there could be various kinds of discoveries? Can the artist come in and say that there are 10 ways of looking at something?’ Altering the point of view is very important. Only then can you look at things afresh,” says Anurupa. I first came across her work while reading a short monograph titled Storytelling and Puppetry as Tools of Conflict Resolution: Experiences from Kashmir, one of the outcomes of a project undertaken by Anurupa in 2005-2006 thanks to a fellowship awarded by Women in Security, Conflict Management and Peace (WISCOMP), an initiative of the Foundation for Universal Responsibility based in Delhi. It is a powerful documentation of her interactions with girls in Kashmir, in workshop situations – involving guided meditation, games, exercises, puppet-making, storytelling, songs, folklore, poetry, and dialogue – designed to build trust and confidence, thus laying the basis for coping and healing. The sharing of these experiences eventually led to a stage production devised to take the voices of these young Kashmiri women to audiences outside Kashmir and familiarize them with realities that are unavailable for instant consumption through mainstream media. Anurupa wanted to use cultural resources in the community – particularly the resonances of Lal Ded or Lalla, the 14th century mystic poet of Kashmir – to strengthen and celebrate resilience, love, peace, and nonviolent resistance. In knowing Lalla, the girls got to know themselves better. And in working with them through this process, Anurupa got to know herself better. Self-exploration, as she says, is at the heart of her work. The author has been awarded a Media Projects Fellowship by ComMutiny in collaboration with the Youth and Civil Society Initiative of Sir Ratan Tata Trust and DKA-Austria. He can be reached at chintan.backups@gmail.com. To know more about the 5th Space, visit www.facebook.com/5thSpace.